My drawing hand is always sweaty, especially when I get nervous or excited about something. But most of the time, the weather plays a huge contribution to my sweaty palm. When I was drawing on the Intuos tablet, my drawing hand would be sticking on the tablet surface, making it hard to glide across when drawing long lines. Now that I am drawing with the Cintiq screen tablet I want to draw long lines without getting resistance. Many have suggested using glove to prevent direct contact between the skin and the tablet surface. So I went around the house to find me a pair of glove that has been lying around for ages in the tool box, still wrapped in plastic. 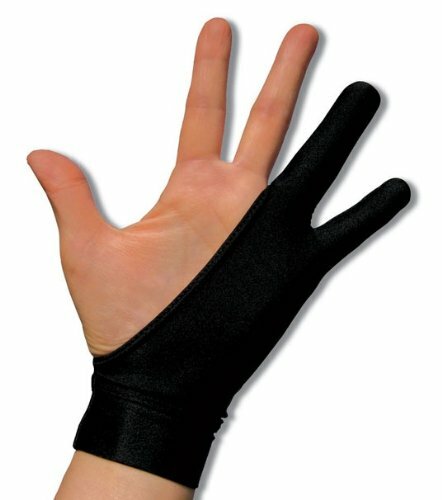 I have actually seen a specially designed glove just for the screen tablet. XP-Pen produces it. There is a proprietary brand that manufactures this special glove too. It's called the SmudgeGuard. It is actually a regular glove made of nylon and spandex materials, and according to the manufacturer's website, its materials also aids in perspiration absorption. The glove only comes with 2 finger inserts, for the ring and the last finger, leaving the thumb, index and middle finger exposed. This allow easy grasp of the stylus. The area that covers the side palm entirely thus prevent direct contact between the palm and the tablet surface. I searched the internet and realised that Q10 has it. Most likely it comes from China, as I saw similar product specs displayed on a China online store. I ordered 2 from the Singapore online store, but waiting for the order to arrive, here's what I did. The pair of gloves I found, I took the right hand side and cut out the fingers for the thumb, index and the middle fingers. But I did not remove the materials adjoining the thumb and the index finger for better support. My last and ring finger remain in the glove. It works very well. Just when my palm feels sticky on the tablet, I wore the glove for a test spin. The glove glides very smoothly and it helps me to draw long lines without jamming brakes. Everything went well until I looked at the stylus. It has lint all over the pen's barrel. Now I have to look for my lint sticker. Well, the hack is good, now my stylus looks like it has been used for a hundred years.